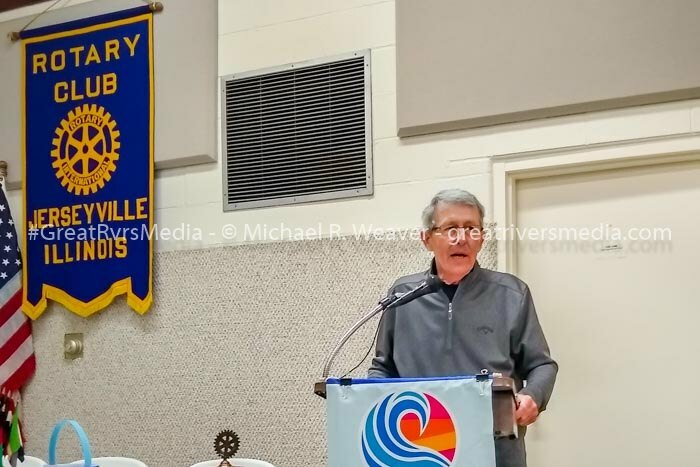 JERSEYVILLE - Jerseyville's mayor seemed uncomfortable with a couple of development related questions at the end of a Q&A session during Monday's Jerseyville Rotary Club meeting at Peace United Church of Christ. Recently re elected Jerseyville mayor Billy Russell spoke for almost half an hour on a variety of subjects during the lunchtime meeting. While Russell has been a no show to most all Jersey County Board meetings since he has been put on the monthly meeting agenda to give updates on the proposed intermodal development, he stated yesterday, "As always I'm more than happy to speak to all of the organizations in our community, in our county and in our region." The mayor continued with his appreciation for Rotary's providing trees for Wock Park and the involvement of the Jersey FFA. Russell said that he has a new council being seated on the 23rd and he didn't believe there would be too much of a change. He said that Nick of Nick's pancake house would be the new commissioner of streets and Zach Crawford will handle public properties. 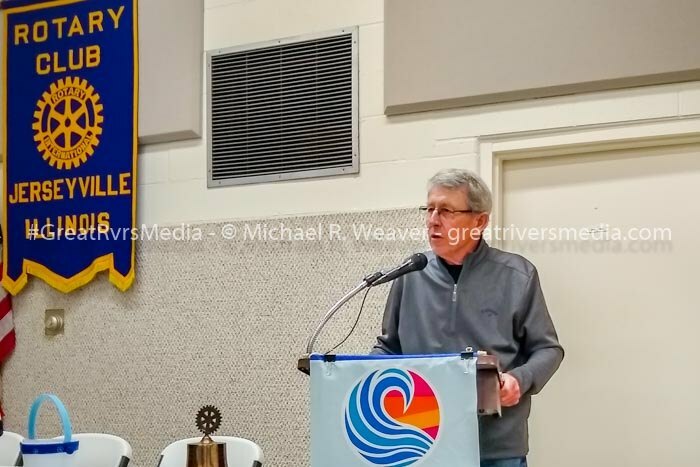 Russell sees highway 67 expansion as a top priority given the impact of local traffic in that anyone can see at 3:30 in the afternoon that it takes longer to get through Jerseyville than it does to get from Alton to Jerseyville. He said that the city has been waiting for five years for funding of repaving of 67 through Jerseyville with the city already having their matching funds available. The mayor stated that he hopes that the funding will be included in the next capital bill. The mayor also said that businesses that are willing to talk to the city are, "worried about workman's comp and tort reform". Russell continued that the city of Jerseyville has a "major problem with opiate abuse. My police force works diligently every day. That takes up 90% of our resources every day in public health and safety. Of what my officers are out doing." "We have a census count coming up in our community which is vital to federal and state funding. We're organizing now for the census count. We have a declining population. We have a declining business. The city of Jerseyville is 70% of our operating income comes from sales tax. Every business that moves out of our community is a loss to the public services." He went on to say that "Right now as the city of Jerseyville sits, we have not one new housing start." Toward the end of Russell's speaking and before he took questions, he reiterated that "That private developer, when he's ready to bring things forward, he has not asked anything from the city of Jerseyville. He has not personally asked anything from the county of Jersey". "I can only say that they are going through negotiations right now with Kansas City Southern rail on some contractual issues that they need to get settled and then I am sure that we will hear from Stonemont Financial." The mayor then continued by taking questions. One of the first was regarding the funding of the 67 extension and the mayor responded that it will be known by the end of May if it will be included in the upcoming Illinois capital bill. The next question regarded the now shuttered Shop-N-Save building. The mayor responded with, "Funny you should mention that. I heard this morning that, this is strictly hearsay, that there was a phone call made by the owner of that building that the old Walmart and Shop-N-Save buildings will be torn down." He later continued with "They (Walmart) have no interest in putting someone in there to compete against them". When asked about the city using eminent domain to take the property because their belief is that it creates a real problem for Jerseyville, the mayor replied with, "There are two reasons. A lot of people have worked hard their whole life to accumulate what they have, and I don't feel that telling people that the investments that they've made, that the city has any right to come in and tell them what to do with their property. We haven't officially got that notice." Russell shared that Walmart is currently paying $38,000.00 a month to keep the building unoccupied. The questions then turned to the intermodal project with one person asking that if they have not asked Jerseyville for anything yet, aren't they going to need to? Is the revenue they bring to the area going to be significant enough that it will offset the expenses we will have when it comes and the ongoing expenses we will have? Russell said, "We are working with the EDA, as far as the funding. We are working with them on grant funding for infrastructure. This is for 67, for expansion of Jerseyville to the south, north, east and west. The development, what Stonemont's done in El Campo, is pretty much on their own dime". The last questions provided to the mayor got him visibly upset. Russell was asked "You keep talking that this is all private money, isn't it a bit disingenuous to say that when in fact the city did the..." At this point the mayor interrupted with a reminder that the person putting forth the question was a guest at the meeting. The question continued "Isn't it disingenuous to say that it's private money, but in fact there's all kinds of public money that's essentially being thrown at this because the county's spent in excess of $200,000.00 on preliminary things that they would not be doing if it was not for you?" The mayor responded with, "That's a question that you'd have to ask between the EDA and the county." The last question asked was regarding the life safely issues that will face the area if train traffic blocks the roads. "With the town possibly being cut in two by increased train traffic, who will pay for the overpasses and other things needed to make sure there is no impact to public safety? The truck traffic on the roads will be extreme if the road is not completed by the time everything gets started, no one is going to want to come to Jerseyville for any reason." The mayor responded with, "I don't disagree about the road, I don't know where the train traffic comes from. I can't answer that and you can't answer that. Where the train is going to cut half the town off." The mayor was told that since the development will site south of town and there will be increased train activity with them slowing to enter the facility, it will be a problem. Russell said he absolutely knows that trains can't legally block the crossings and he would be incorrect in his belief. An Illinois Supreme Court decision from 2008 struck down a state law that said rail crossings could not be blocked for over 10 minutes. It rules that the law was unconstitutional and preempted by federal law. The court found that only the Federal Railroad Administration (FRA) has the authority to regulate blocked crossings. The mayor ended his time with, "They (trains) come through every day." That response got another visitor to push the mayor regarding these issues but Russell eventually ended the discussion with agreeing that you can't get an ambulance through when a train goes through town but that it's been that way a long time. "That's an issue for the city of Jerseyville and it's community and it's citizens." He still had no answer with regard to planning for train and truck delays and public safety as the meeting ended.